The Asian citrus psyllid (ACP) is a very small flying insect that feeds on citrus plants (oranges, lemons, etc.) and other closely related species, by inserting its needle-like mouthparts and sucking out plant juices. Huanglongbing (HLB) disease is caused by a bacterium that spreads through the plant and destroys citrus tree production. When the psyllid feeds on an infected plant, it takes the bacteria into its body. The psyllid then moves to a healthy tree and while feeding on it, infects the plant with the disease. Trees infected with huanglongbing produce inedible and unmarketable fruit that is green, misshapen, and bitter. The disease will also kill an infected tree within 5 years; there is currently no cure for this plant disease. 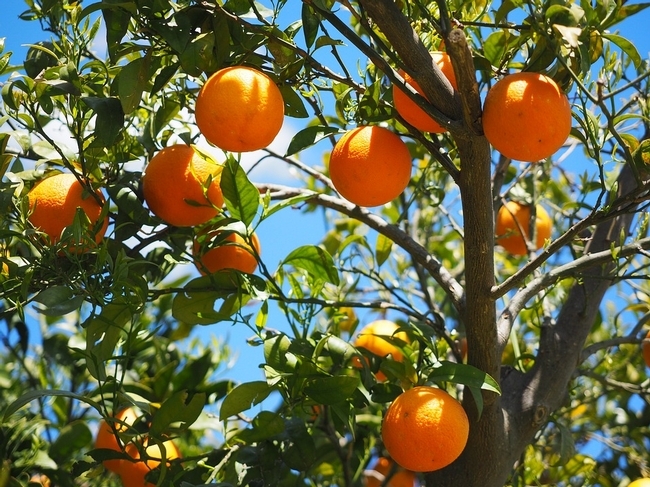 Infected citrus trees are being found almost daily in backyards of California residents, especially in Southern California where the disease is more prevalent. Trees found with the psyllids are often treated with insecticides; trees that test positive for the disease must be removed. How could this invasive pest affect California? This insect and plant disease are of great cause for concern for California citrus growers, since the California citrus industry contributes $3.3 billion in revenue and employs more than 22,000 people. To give some perspective, in Florida, another important citrus producing state, a 75% decline in their $9 billion citrus industry by 2005 was due to Asian citrus psyllid and HLB disease. Check your trees often for the Asian citrus psyllid. Never transport citrus plants, budwood, or plant material like leaves out of your area if you are in a quarantine zone. Purchase plants locally from reputable sources. Control ants around citrus trees. Ants interfere with the “good bugs” that are helping reduce ACP numbers. Spread the word. Talk to your friends, family, and neighbors about ACP and HLB. Learn more about the pest and disease by reading the Pest Notes: Asian Citrus Psyllid and Huanglongbing Disease. Find out if you live in an area where the psyllid or disease has been found. Visit the Citrus Pest & Disease Prevention Program website and view their map. If you have citrus trees on your property, inspect them frequently for the psyllid, whether or not you live in one of these areas where the insect and disease have been found. Researchers at the University of California and their partners have been awarded millions of dollars to study and fight ACP and HLB. Efforts are ongoing to increase awareness among residents who grow citrus in their backyards and commercial citrus growers. Researchers will continue to focus on ways to deal with ACP and HLB including biological control efforts, effective pesticides, and studies to understand further how the bacteria travels throughout citrus trees and developing bactericides to fight it.